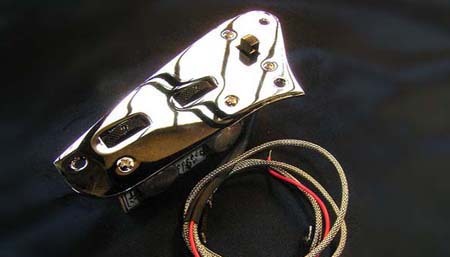 Atelkof Lutherie uses only RoHS compiliant parts assembled and welded with lead-free soldering wires (Pb free). Wiring a guitar... what a question! 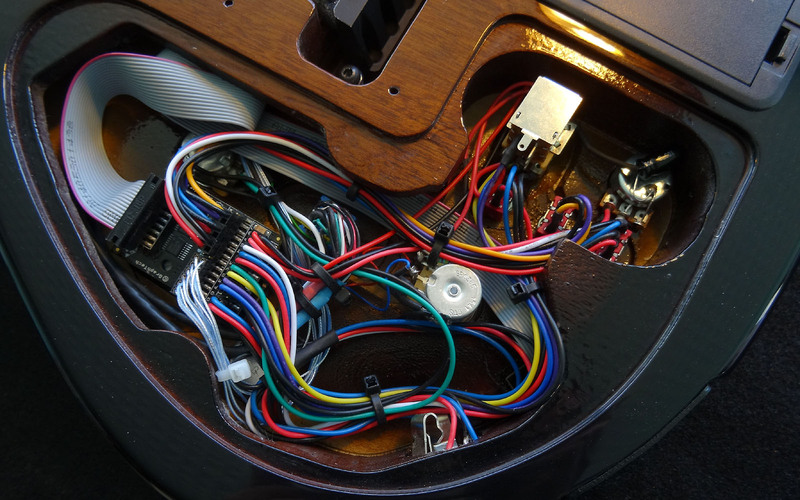 Wiring is a complex part of the instrument: more that connecting electronic components it has to insure the commutation of any signal source but also leads a part of access and ergonomics. Many customers use to come to my workshop with wirings downloaded or printed from the web... It's okay but why do they want to put a limit on what does already exist? In a way I agree with them and I will often prefer the security of an old proven solution. But sometimes it's necessary to break the old certainties and follow new innovative paths. The world changes and the music changes too. Building a guitar often means using a dozen of specialty trades. Electronics is one of them, but wiring is more than a simple part of it: sure it's a skill! Wiring has its own laws and technical rules. On stage there’s no time to think or hesitate, there's no need to have much but only what you need. Quantity does not mean quality. That's the reason why I consider developing your schematic diagram is a key step of the project. Here at Atelkof I spend a long time searching for new diagrams and new components to reach new horizons. Passive vs. Active... Cheese or desert?... And why not both? Passive or active?... I'll always still prefer flexible solutions to rigid answers! 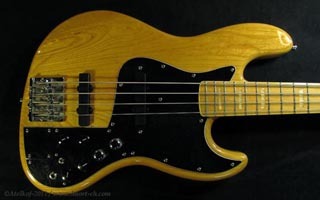 I still remember one of the first affordable active bass, the Music Man®. Until then only some luxurious upscale items where provided with an active tone system. Most of us, then teenagers, where asking themselves what it were about? Today, the use of active tones and preamps has become very common for a bass player: even semi-parametric mid controls seem to come as a standard. 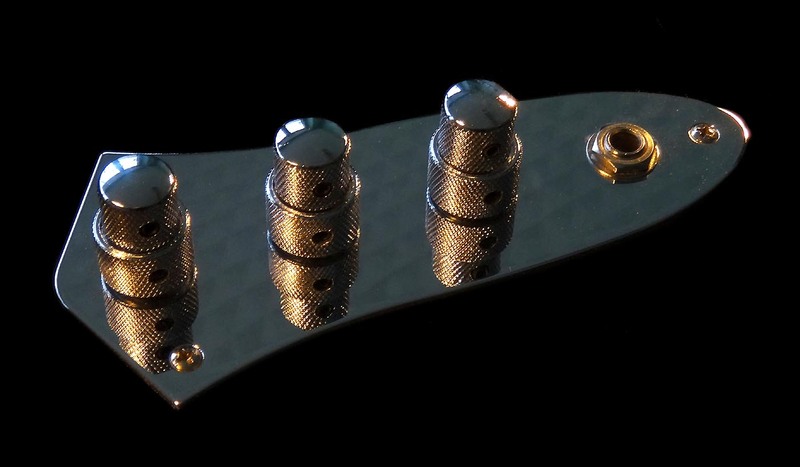 Even if the use of on-board electronics is more sporadic for guitar players, it currently appears as an intermediate solution between traditionnal passive wirings and the unflexible "all-active" pickups systems. Take care! An active circuit doesn't work as a magic wand, the instrument as to sound by its own. The output of a system is no more than an "homotetic" picture of its input. So, even the best preamp won't magnify your sound if the "frame" can't deliver a strong clean vibration. My home designed circuits are developed with the complete architecture of a real "micro" preamplifier to insure the perfect signal processing from the pickup to the amp. All of them can offer a "true passive" mode to keep the security of using the instrument without any battery whenever you want, whenever you need to. Now there's no more border line between two generations of instruments. Choose what you want at the exact moment you're thinking of it: passive pickup with passive tone, and next switch your sound through a complete panel control changing the face of your playing. An active circuit means that the circuits requires an external power supply to run correctly. It also mean tha the circuit can boost (increase the gain) of the original signal. The preamplifier is a part of the amplification chain that leads the signal processing until it can reach the level required by the power amplifier (Normaly 500 up to 750mVrms ). The preamplifier also provides a correct output impedance. A tone circuit allows shaping or equalizing the spectrum of the signal by filtering some selected frequencies. These frequencies affected by the tone control(s) are commonly called band or bandwidth. We can meet several types of bands characterized upon the parameters of the filter: A filter is called low-pass when it cuts the frequencies above a value called the cutting frequency. The high-pass filter cut the frequencies below its cutting frequency. Using both low and high-pass filters will be called a shelving tone. A band-pass filter will keep a relative band of the entire spectrum, often around a unique frequency often called tuning frequency. This kind of filtering shape is also called graphic (opposite to the shelving mode). A graphic equalizer is built around several tuned frequencies (bands). Some band-pass filters sometimes allow changing (sweep) their tuning frequency or enlarge the bandwidth (Quality factor "Q"): they are called parametric filters. However, due to a heavy complexity to setup gain, frequency and bandwidth for a single control, the most current filters are only semi-parametric with only gain and frequency. 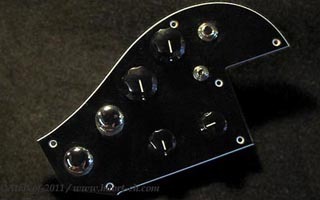 Sweeping the frequency control of your parametric while playing will produce a "wah" tonal effect (like a wah-wah pedal) that is in fact the well known parametric guitar effect ever used. From single up to quad band circuits, and even more!... an overview of what's already available. All these circuits are based on the use of J-FET input Lin-CMos amplifiers offering high input impedance, high value of slew rate and low static power consumption. They have a buffered input providing a cool interface whatever the kind of pickup you choose (passive or active). 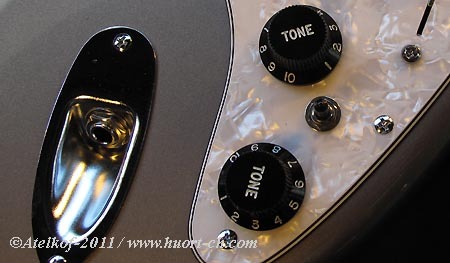 The tone control stages are separated to optimize response and signal processing. The output stage gives low impedance to improve the adaptability with today's systems requirements. Both 9 up to 18 Vdc power supply are permitted and olso keeping low power consumption (Icc Moy. de 1,2 to 1,7mA @9Vcc... 2,1 to 3,4mA @18Vcc). Battery average life is from six to eight months under normal use, upon models (Mesured average autonomy of 500 up to 600 hours under continuous discharge). For much more respect and cost saving please choose the use of NiMh or Li-Ion accumulators. 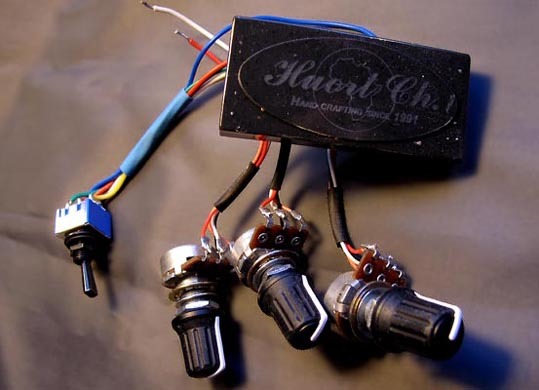 1 band, 1 pot, true bypass, works like a tue passive tone with active buffer ! Nota: The following items maybe retrofitted on many other instruments. The installs are possible only in our workshop. They are not available for fale separately. Dual band active tone circuit. Average bias consumption: 360 up to 600 µA @ 9Vdc supply. Power supply: 9 volts alkaline battery or NiMh accumulator. Average battery life from six up to eight months under normal use. Three frequencies switchable midrange control*. 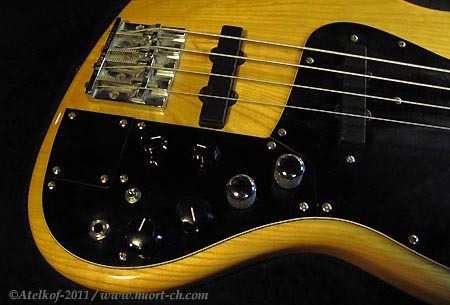 Same characteristics than the SRX-3PM circuit for "Marcus Miller" signature style instruments. A true FET / J-FET solid state pre-amplification offering the best blend between concumption and vintage sound presence. The complete three bands module may require cavity modifications - Available for home customization only in our workshop. Not for sale separately. Power supply: 9 to 18 Vdc or NiMh rechargeable accumulators. Bias current consumption: 600 µA up to 1,40mA (will depends on power supply level). Average battery lifetime usually up to 4 / 6 months for normal use (Average measured continuous discharge of 500 hours). 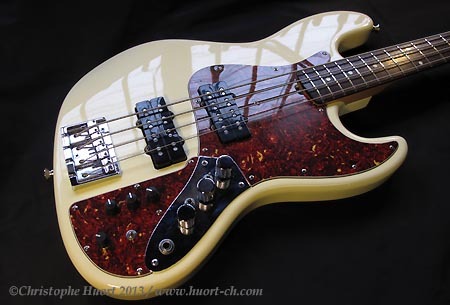 Another version of the active Jazz Bass keeping the traditional controls metal plate... A unique look! 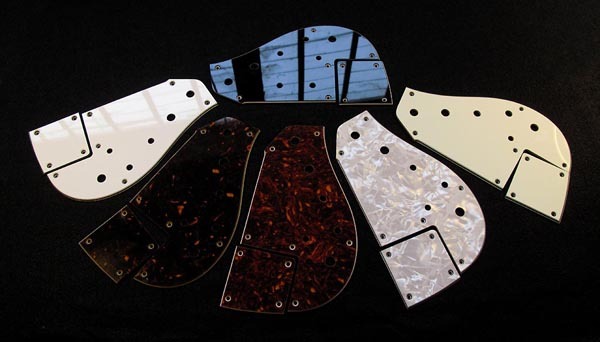 (Many colours of pickguard available).